Keywords are your golden tickets to being discovered on Pinterest by your target audience and ideal customers. 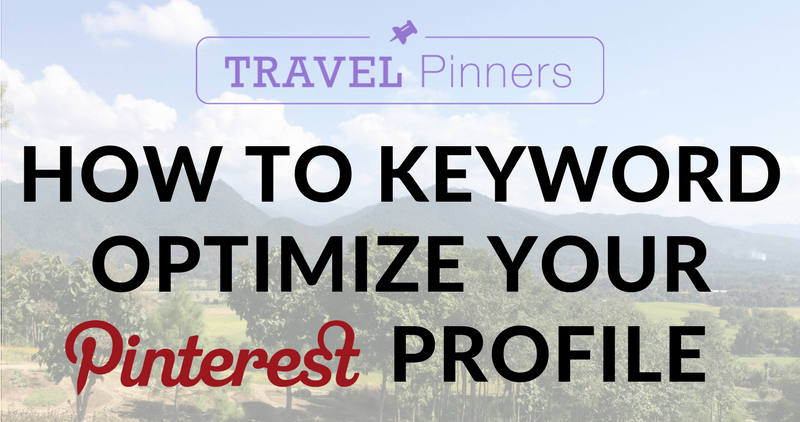 If you know what keywords your customers search to find your travel services and offerings, why wouldn’t you include them on Pinterest so that pinners can find your content there? Below, I walk you through the 6 best places to keyword optimize your Pinterest account so that you can dominate the Pinterest search results and get discovered quickly. Keep reading until the end for an *essential* bonus trick that can put you on the Pinterest map. The first place where you want to keyword optimize your Pinterest profile is in your username. This is the account name that appears in the URL of your Pinterest profile, and it should be the same username as those you have used on all your other social media platforms (if available). A way to know whether or not your desired username is taken is to check “pinterest.com/____” with the username you want on the end. If this page doesn’t exist, that username is yours for the taking. What if your desired username is already taken? Simply hit save on the username you’d like to have, and Pinterest will default it to another name that is similar to the taken name. Often times this will take the form of a couple digits tagged onto the end of your desired username. If you prefer to choose an alternative, such as a variation of your username on other platforms, just be sure to check first, as Pinterest automatically changes it by adding on a few numbers, instead of giving any kind of warning or notification that the username you wanted is already taken. 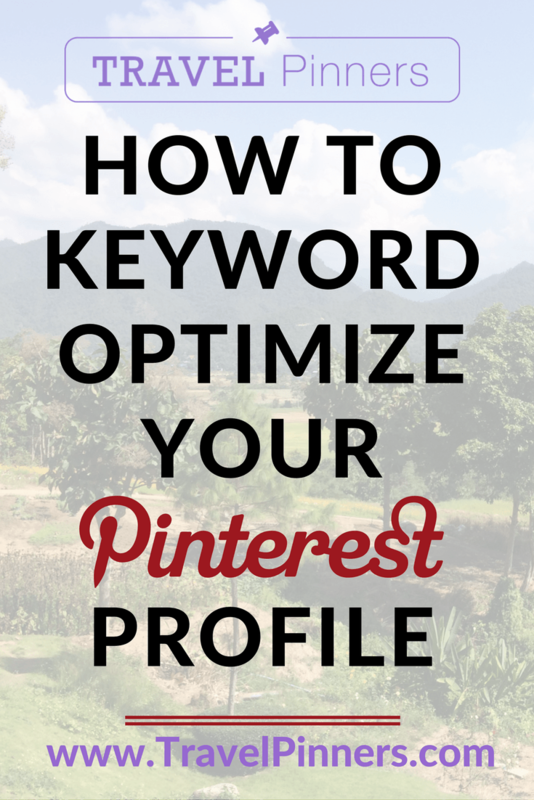 Your account name is another place where you can keyword-optimize your Pinterest profile. You want your brand name to be the first thing you see in your account name. A clever way to give your account more SEO juice is to use the long line symbol “|” (located above the return key on your keyboard) or the dash symbol and enter in keywords relevant to your travel brand on the other side of the line. This allows users to know what you’re about right away, as your account name is displayed at the very top of your Pinterest page. This also helps Pinterest index your page according to keywords in your account name, and is more likely to show your pins to users searching for those words. Also, if someone were to search those words and filter by “People”, your account would pop up in the search results. So, if you sell a travel offering or niche travel service, consider what keywords people might be using to search for what you offer, and include those in your account name. The “About You” section, which serves as the bio portion of your account, has become smaller and less noticeable with recent updates to the Pinterest interface. However, this is another key spot to use thoughtful keyword optimization. It is the place to offer a general description of what your brand offers and values, and therefore it is a prime location for keywords that will match the search entries of customers seeking your services. While you want to capture the essence of your brand in this section, there is a limit to how many characters you can enter. That being said, make sure to check that the information you’ve entered here hasn’t been cut off (Pinterest won’t inform you that your “About You” blurb is too long, so you need to verify that all of your information fits in there and if not, shorten accordingly). If you are just beginning to venture into Pinterest marketing, you might be aiming to create about 20 boards. If you have a more developed Pinterest account, you might be growing your count up to about 40-60 different boards. Maybe you share a mixture of your offerings (blog posts, service listings, etc.) as well as posts matching the interests of your audience. Regardless of the quantity or topics, Pinterest board names give a crucial opportunity to keyword optimize with words related to your brand, so you want to be strategic about what you include in them, using words that could lead clients in search of your services right to you through the search engine. The magical aspect of board name optimization is that, even if your board contains a pin with a description that doesn’t include the same keywords, this pin could still show up under searches that include terms in the board keywords. For example, if someone searched for “wall designs”, a pin might appear in search results that didn’t necessarily contain the keywords “wall designs” in its pin description, but it appears because it was pinned to a board called “wall designs”. In short, you want to use your board names to tell Pinterest (the machine, bot, whatever you want to call it!) — what kinds of things you are showcasing on your boards, so that they index your content and get it to places where prospective customers interested in what you’re sharing can find your pins. The board description is where you want to expand upon the keywords you’ve already included in the board names. This particular area allows for more characters than any other, so take advantage! A good method for finding relevant keywords to include is by searching a possible board name on Pinterest and seeing what secondary keywords pop up along the top of the screen with the search results. This feature is known as the Guided Search— these are the words that the “Pinterest machine” commonly sees searched with the words you typed in, and they are related words that are great to incorporate into your board description to increase your SEO power. Keyword stuffing in the board description is discouraged. Instead, use a thoughtful description that actually describes what is on your board, what you can find there, and the board’s purpose. This is another place to plug in a URL to your website with the purpose of leading visitors there for more information, in case they happen to land on your board and not yet be familiar with your brand or offerings. I also want to warn against using the same board description for every board you make, filled with the same general promotion of your website. It’s much more meaningful to the end user if you give a 1-3 sentence description that pertains specifically to that board, with the option to find more information about these kinds of topics at your website. The most important place to keyword optimize is in the pin descriptions you fill out every time you create a pin on Pinterest. This is a prime spot for keywords. This is where you describe the content that visitors will receive when they visit your website by clicking on the pin. Keywording stuffing in the pin description is a big no-no. If you are creating a pin for a product listing, say exactly what the product is and avoid being misleading. People will bounce out of your website pretty quickly if you led them there with a deceptive or incongruent pin description. Instead, include a purposeful description. Think about how you would write a service description or metadescription for a blog post– your pin description should be just as informative and enticing. Here is another location for a soft call-to-action and your website URL, such as “Read more at (link),” although this is not necessary for every pin you create. At the very end of your description you can tack on a few keywords separated by the long line symbol “|”, but your main objective is to draw people in and engage them by cleverly describing what you have to offer and what they can gain by clicking through. A lesser known way to boost your keyword optimization on Pinterest is to optimize the filename of a pin image before you upload it. You can use this trick whether you are directly uploading from your website or uploading through a social scheduler like Tailwind (<< if you make a purchase through my affiliate link, I may receive a small commission, at no cost to you), my personal favorite Pinterest scheduling tool. 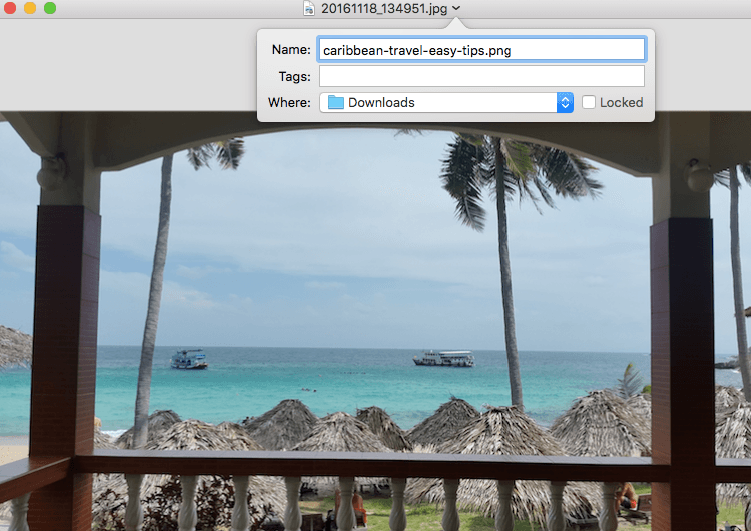 All you have to do is update the filename of the image by replacing the random numbers it defaults to, such as “IMG3820.jpg,” with keywords you want to be searched for with separated with dashes. Example: keyword-optimize-file-names.jpg No one on the user end will be able to see this because Pinterest changes the filenames on the platform before someone can download the image onto their own computer. However, the “Pinterest machine” does take these words into consideration, and this is just another way to let Pinterest know the content of your image and index that pin accordingly. There you have it! These 6 tricks for keyword optimization will place you right on the path to Pinterest marketing success. Who knew it was so much like Google? !